According to The Old Farmer’s Almanac the moon will be full Wednesday, April 28, 2010 at around 5:18 a.m. Las Vegas, Nevada time. “American Indians gave names to each of the full moons to keep track of the passing year. The names are associated with the entire month until the next full moon occurs. Since a lunar month averages 29 days, the dates of the moons change from year to year. Here are titles most closely associated with calendar months” – Western Washington University. Click the link for Native American moon names. Out West on the Southern Plains, Apache’s refer to the April moon as “Moon of the Big Leaves,” according to Western Washington University; no Apache translation is given. La Loma is situated at the top of a hill at the top of a steep driveway, and at the top of most Denver-Mexican-Restaurant lists. It’s one of the best Mexican restaurants in the Denver area and definately one of the classiest. The Old House is an island of tranquility and class in an old, North Denver neighborhood. Dark woods, exposed brick/beams, cozy booths, and an antique, (working) taco machine provide the background for this above average Mexican restaurant. 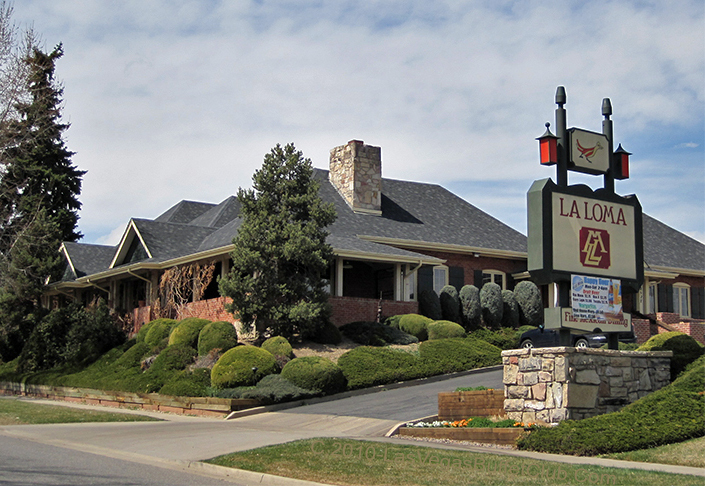 LA LOMA’S OFFICIAL WEBSITE with full menu, directions, photos and more. Hispanic neighborhood near – what used to be – Denver’s Little Italy.